Fleeced: Vicuñas are found in the central Andes. The smallest member of the camelid family, weighing at around 100 pounds (around 45kg) and standing just under 3ft high, vicuñas live in the extremes of the high-altitude Altiplano region of the central Andes. The incredibly soft and luxurious fleece of the vicuña—with natural colours ranging from golden brown to deep fawn—has made this shy and diminutive creature a sought-after treasure. The vicuña has a fine, tawny coat with cream coloured chest, legs and belly. With each fibre measuring just 12 microns in diameter, a third of the diameter of sheep’s wool, vicuña fleece is finer than the most select cashmere. Vicuña fleece is rare and the costliest natural fibre in the world. 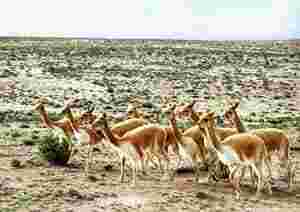 Vicuñas may be shorn only once every two years in a chaccu, a tradition of fleecing, in which the vicuñas are herded into pens and are carefully sheared and released unharmed. Through strict protection measures their population has grown but the numbers still remain small (roughly 1,50,000). A team of 18 textile designers create and sell the Holland and Sherry product in Europe, West Asia, Russia, the US and Far East. In Asia, the product is available in China, Hong Kong, Japan, Korea, Singapore, Malaysia, Thailand and India. The fabric, sold here by Digjam, can be made into any number of products (shawls, suits, etc), and yes, kilts are a possibility.